Paleo ‘treats’ like waffles have always been an area of controversy within the community and I’ve seen it discussed a lot in groups that I’m in lately. If they are something you choose not to include, awesome. If they are something you choose to include, awesome. Everyone is different. There is no perfect approach. Just make sure you are doing things for the right reasons. So often I see unhealthy pre-paleo SAD food habits, turn into unhealthy-healthy paleo food habits. The food gets better, but the mental process doesn’t. Are you avoiding that paleo treat because you just feel better without it, or are you avoiding that paleo treat because you feel incredibly guilty or are so obsessed with healthy food choices that anything that isn’t meat or veggies gives you anxiety? I don’t say this lightly. I’ve been there. See, for me it’s about sustainability. In the beginning of this journey recipes like this one really made the difference in helping me transition to a healthier lifestyle. Now recipes like this help me maintain it for the long term. Waffles, cookies, and blooming onions are not part of my regular diet, but when the mood strikes or we are celebrating a special occasion I pull out my favorite paleo ‘treat’ recipes with no guilt. Do you see I said there? No guilt. That is the difference between pre-paleo and current day for me. When I really got to know my food, what it does for my body, and where it comes from suddenly my relationship with food changed. I no longer carry the weight of negative emotions with my food choices like I did in the past. That’s so freeing. Ok, so what’s the point of this ramble? Don’t let your diet become a dogma. The stress of maintaining a ‘perfect’ diet is often more damaging than any potential consequences of allowing ourselves a healthy treat here and there. Because a lot of my readers follow AIP or paleo because of autoimmune conditions and food intolerances I want to make it clear that I’m not saying to eat foods that you shouldn’t be due to very real health reasons. I’m saying to take care of both your body and mind in the process. Enjoy the possibilities. One last thing before we get to the waffles, I want to make sure you know all about the Autoimmune Penpal Project which launched yesterday! This project aims to connect individuals living with autoimmune or similar chronic diseases to other warriors in the same fight. The focus is to bring positivity, connection, understanding, and growth to a healing lifestyle. It is open to anyone living with an autoimmune or similar chronic disease. You will receive a personally matched penpal partner (based on disease, lifestyle, & age), access to a participant Facebook group, and prompts and suggestions for writing topics to share with your partner. If you are interested in participating you can get all the details and sign up here. The first round of participants is limited and I expect to close the registration within the next few days, so sign up ASAP if you want a penpal! Alright. I delayed it enough. I give you super fluffy cassava waffles! Preheat your waffle iron to medium. If you normally have to grease your iron make sure it's well greased. In a large mixing bowl whisk together cassava flour, baking powder, salt, and sugar. Separate your eggs and add the yolks to the dry ingredients. In a medium bowl beat eggs until stiff peaks form. I use an immersion blender with a whisk attachment, but a hand mixer will work also. Add vanilla extract, ghee, and milk to dry ingredients and mix until well combined. Fold in egg whites. The batter should be thick. Spoon the batter into your waffle iron and cook per your iron's specifications or until there is no longer any steam. In my waffle iron it takes ~ 5 minutes. Waffles will be crispy on the outside and soft and fluffy on the inside. Serve warm or freeze for another day. Your dough will be very thick. You can use up to 1/2 cup more of milk, but it will change the texture slightly. This recipe proudly uses Otto’s Cassava Flour. You’re so welcome! I’m glad everyone enjoyed them! Thanks for letting me know. Hi Kristina, I don’t usually comment on peoples blogs but I had to here. For anyone contemplating making these I have to tell you…they are AMAZING! I didn’t read the directions so I had no idea I was suppose to whip the egg whites. I made pancakes. Just threw everything together, mixed it and they were still fluffy! So close to regular flour pancakes! Thank you so much Kristina for such a great recipe!!! I’ve shared it with my other AIP buddies and pinned it. AWESOME JOB!! Thanks so much for letting me know that they turned out for you. Great to know that the batter works for pancakes too! Will have to give it a try. ? Next time whip those egg whites. It totally brings a little extra specialness to them! Hi Kristina! I was very skeptical as here in Austria we don’t have Otto’s cassava… so I had to take what I could find in a store. Hi Alma! I’m so glad it worked out for you. I love them toasted the next day with some ghee, cinnamon, and a sprinkle of salt! Thanks for giving them a try. Had these this morning, and omg, they were wonderful! Thank you! I am wondering if anyone had tried these with chia eggs or another egg alternative. Thanks. I’ve been told that gelatin eggs work, but they won’t have nearly the same fluffiness. Preach! Great post and I cannot wait to make these over the weekend! Girl! You’ve got a WINNER here! I added fresh blueberries and pecans to mine…..DESSERT! I think I’ll try them savory too, like with garlic and onion bits and eat them like bread for sandwiches! Lovin this! Thanks so much! I love add ins. There’s an apple version on the blog too! Let me know how the savory works out. Yup. I’d just add more liquid until you find the right consistency. So glad I found this recipe! 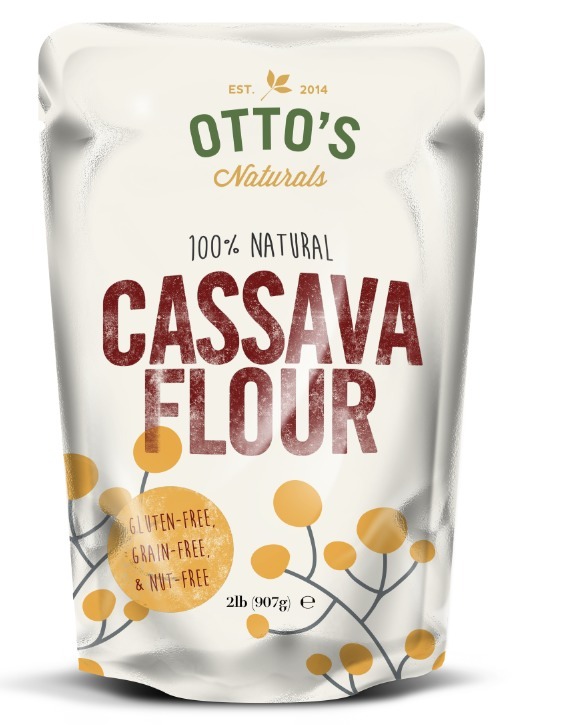 I’m new to cassava flour and am amazed at what it can do. My batter was still crumbly so I added more nut milk. It turned out great. It’s so nice to have really good GF waffles for the waffle brunch we just hosted. It’s a keeper! This looks so good! Where else can I use ghee as a baking substitute? Thanks for sharing! What a yummy breakfast meal prep idea too! This recipe blew my mind! It made me happier than I’ve ever been since reducing grains. My daughters loved it; one thought these were better than “regular” waffles. Thank you! !